What does the R72 designation in the Hoya R72 IR filter mean? He says it’s not easy, but still doable. A Cokin P007 filter was used. It only comes in one, rectangular size. You’d need to get a suitable filter holder and adapter. Probably more practical to get the Hoya, which will set you back USD300 if you go for the 77mm size. A suggested approach to postprocessing IR images. Step by step tutorial, from approach, to image capture to postprocessing. Convert your camera to IR? 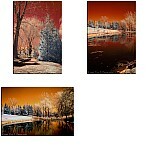 IR conversion is permanent (Lifepixel.com offers such a service), and something that needs to be thought through. In terms of IR sensitivity, D100 > D70 > D200.